It’s that time of year again when it is great to be in England. All hail the month of Glastonbury, the beginning of a three month Pimms season (which will flow heavier than the rain in good old British stoic defiance of the weather) and of course, summer holidays are just around the corner. So as we soak up the ancient cities of Central Asia, walking along dusty city walls surrounded by turquoise minaret adorned mosques, my country folk back home will be raving under muddy canvas and perhaps enjoying a fortnight break in the Mediterranean. And to be quite frank, I feel a tad jealous. Or at least I did, until we got stuck at sea for a few days that is. Because it turns out that crossing the Caspian Sea is a bit like a three-day dirty festival, in the middle of the ocean in 35 degrees sun. So I kind of got everything I wished for. Kind of. The Caspian Sea, which is almost like a huge lake in the middle of Turkmenistan, Azerbaijan, Kazakhstan, Russia and Iran, is actually the largest ‘sea’ in the world that does not connect to an ocean. 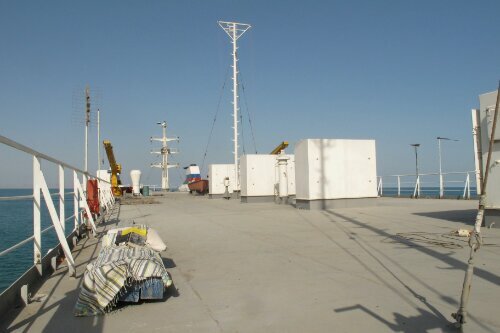 And we were crossing it on a cargo ship from Turkmenistan to Azerbaijan. I was excited about this for a number of reasons but the main one being the mythical sounding name of the sea. In fact I couldn’t even say ‘The Caspian Sea’ without making snake-charming-like motions with my hands and singing it like a magician. I felt convinced it must be the nautical equivalent to a flying carpet and that the journey to central asia would be nothing short of magical. I refused to listen to the gentle reminders, from Matty and the Mongoose, that we were in fact travelling on a cargo ship. No, no, I insisted, we would feel like mystical sheikhs of a bygone era. Admittedly the border control in Azerbaijan was less than magical, taking about an hour and involving rigorous checks of our cameras to check we had not been to an ‘illegal territory’. And, granted, the Caspian Sea looked thick with oil at the Baku Port but as we climbed on board the big ship, my optimism remained intact. The crossing only takes about 14-16 hours but we had been warned there can be delays on either side so we took extra provisions on board, which we hoped would last a few days. We were meant to set sail at 10am that morning, so after dumping our stuff in our little cabin room, we ran up to the top deck to say our goodbyes to the Azerbaijan capital. After a while of not moving we realised we were actually in a prime (albeit unconventional) position for…. sunbathing. That is right, I was going to actually get to sun bathe on my landlocked adventure through Central Asia. There were no visas to sort, no accommodation to book, no sights to see. In fact there was nothing to do but sunbathe, and read, drink and eat. And repeat. And repeat. I dug out my optimistically packed bikini from the bottom of my rucksack, and ran back up to the top deck for my ‘summer holiday’ experience. I’d find the cocktail bar later, I thought. And so it was, in the slightly polluted and industrial backdrop of Baku port that we spent the day doing nothing but turning our t-shirt-tanned-mainly-white-bodies in the sun every half an hour. When the anchor was finally lifted and the boat set sail it was gone 5pm and I realised with some alarm that we had made a serious dent in both our food and water supplies. 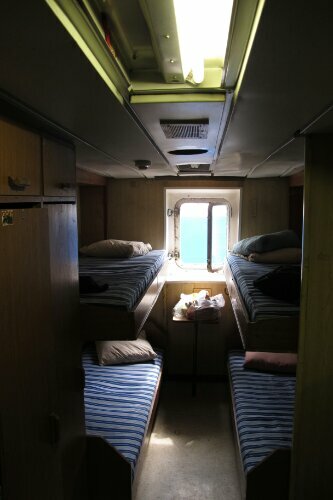 Nevertheless, our spirits remained high and a small kitchen and common room was discovered below deck, where beers were purchased in time for sunset. 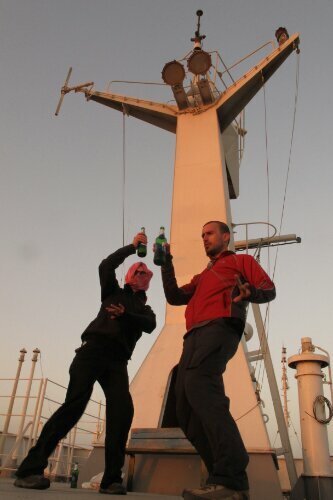 As our beer bottled whistled in the wind, we danced to the sound of the Caspian Sea and our newfound instruments. “It’s just like Glastonbury,” I cried. But the festival experience was only just beginning. 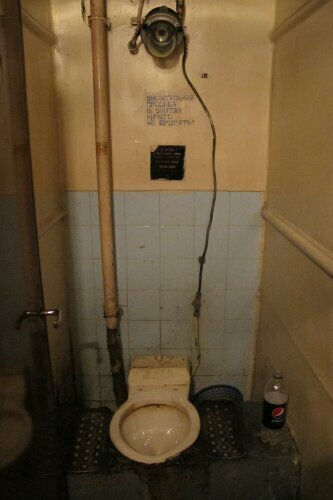 A short trip to the one single toilet for all passengers and staff on the ship (of which there were about 50 – most staff) proved we were in for more than we had bargained for. 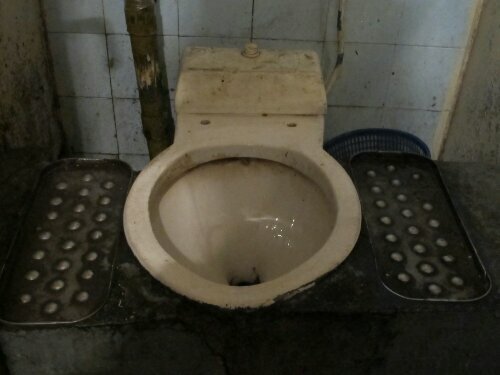 The old school festival trick of entering the loo with the nose firmly pinched helped somewhat deal with the terrible stench although the cubicle was so small you had to climb onto the foot stands either side of the loo in order to close the door. And even at Glastonbury you don’t have to stand on the toilet to squat. And then there was the lack of showers. 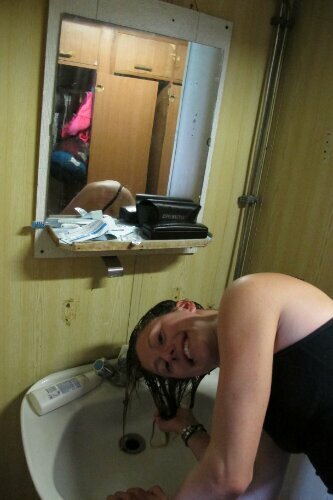 Having being woken up by our hostel owner that morning and told the boat was ‘leaving in an hour’ (there is no scheduled timetable) we dashed to the port without showering so were already feeling a tad grubby. “This is just like Glastonbury,” I cried again. 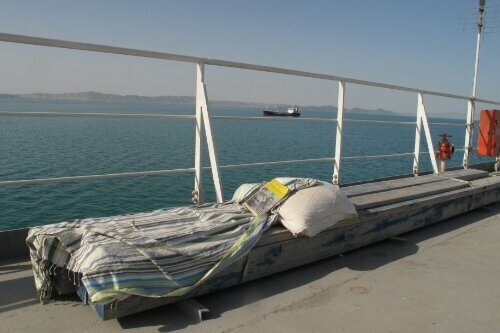 The next day we woke up and the Caspian Sea was glistening in the sun. We ran back up to our ‘sunbathing spot’ and threw our towels down for a few more hours of relaxing. By lunch time we got our first glimpse of Turkmenistan as the coastline appeared on the horizon. But then we heard the clanging and banging of the anchor being unreeled and realised we were no longer moving. Two hours later we were still not moving. Four hours later and the view was still the same. More boats had joined us and we now seemed to be part of some sort of cargo flotilla destined to spend the rest of our days in no man’s land. I decided it was probably time for a wet wipe shower. Of course nobody could tell us why we weren’t moving or when we would be moving or anything at all. But someone in the kitchen did offer to cook us spaghetti with ketchup and some grilled chicken for a few dollars so all was not lost. I started to collect water and purchased a few bottles from the kitchen staff, who when they could be found acted like they were doing us a favour and that the provisions were not really for the few tourists on board. How much water did they have, what if the ran out? My overactive imagination went wild while the boys discussed cannibalism and debated which member of the crew would keep them going longer. 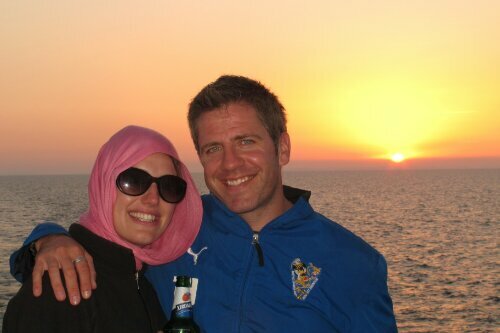 The sun got lower in the sky and we settled in to enjoy another sunset, and another night’s sleep on the boat. Only the kitchen had run out of beer. “This is how it starts,” I thought. The next morning we awoke to the same position – the coastline of Turkmenistan was as tantalising close as it had been 17 hours before. Now entering our third day of not showering I resorted to a sink hair wash, just like the collapsible bowl ones of Glastonbury. We ate half the remains of our food supply and returned to our sunbathing positions on the top deck (with rations of water). There was an anxious air among the other 12 tourists on the boat, who were all part of an organised tour. Even their guide could offer no assurance on departure time. 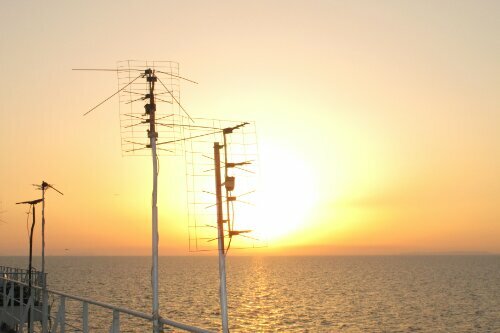 But then suddenly, with no kind of announcement or fanfare, the banging of the anchor could be heard, as if sounding the final act of the weekend… We were on our way to Turkmenistan. We watched in fascination as our great big steel ship was led into the port by comical looking battered tugboats and cheered as the anchor went down for a final time… 55 hours after getting on the boat. And so over the next few weeks as my Facebook newsfeed no doubt fills up with pictures of Glastonbury goers having a whale of a time, I will remind myself that I too have had three days of pure filth and wild hedonism (yes, a sunset beer counts) and a summer holiday akin to a Mediterranean cruise on the magical Caspian Sea, ahem. But I am definitely missing out on Pimms so if you’re reading this back in blighty do have a stiff one from me. 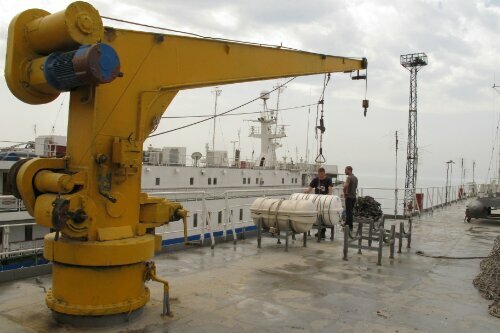 Catching the cargo boat from Azerbaijan to Turkmenistan is notoriously unreliable and there is no real pattern to its schedule. 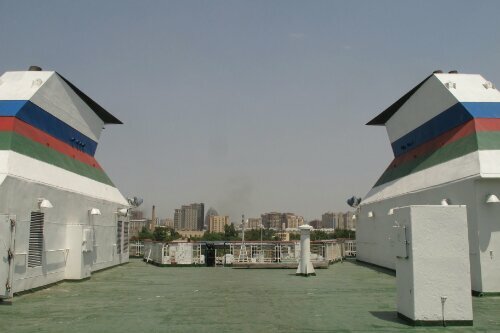 Once we had our tourist visas for Turkmenistan from Baku we headed to the port to enquire when the next ship would sail. A woman in a little hut literally waved us away and said no boat, call tomorrow. The hostel owner at the Caspian Hostel happily called for us at 10am the next day and we were told there was no boat but one might sail the following evening. Then she woke us at 8.30am the following day, saying the woman in the port had called and a ship was sailing in an hour! Needless to say we arrived at the port somewhat unprepared. 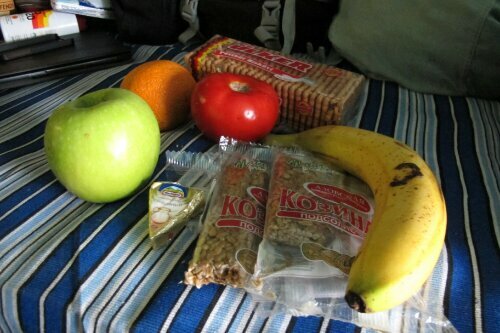 The ferry cost 71 Manat (about £60) and while the boat kitchen does provide water and food the service is somewhat erratic so take ample supplies with you. This entry was posted in Azerbaijan, Recent Posts by Delia. Bookmark the permalink. Nice to read you enjoyed it….sort of! We’ve just arrived in Baku to await a ship to Kazakhstan and this has served well in setting our expectations… Thanks! Definitely not like the Dover to Dunkirk ferry! Maybe I’m too tender for travel further into Eurasia than about Austria?